Trade in your heavy pea coats and puffer jackets for the light weight denim jacket. Perfect for just about any look, On top of a spring dress or paired with cropped dress pants and flats. The denim jacket is sure to keep you warmer while looking stylish through the transition in to warmer months. Warmer weather means adding more dresses into your wardrobe, to be honest the last thing I want to do in the winter is wear a dress in 30 degree weather. Once the temperatures start to rise it's all about dresses. I love a dress with a good texture or print. Speaking of texture and prints, it's one of this years biggest trends! Be sure to invest in pieces that have some texture to them, it's all about the frills and fringe. 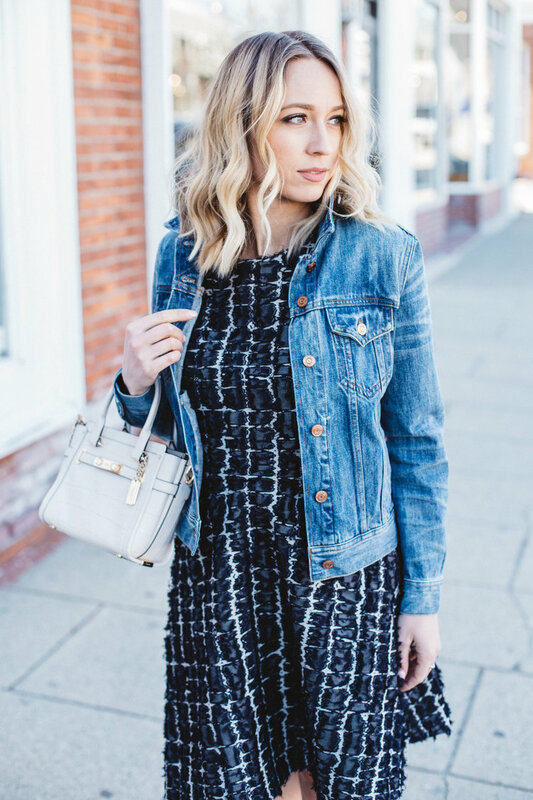 This Banana Republic Dress is all about texture with its denim patches and distressed denim frill details. It's such an eye catching piece and the perfect addition to any wardrobe. An essential piece is the perfect bootie! Be sure to find a versatile boot that can work with different looks. The Banana Republic Magda shoe is so sleek, making it perfect to wear with a dress or throw them on with your favorite boyfriend jeans and blouse for a casual day to day look. It's all about the crossbody and shoulder bags these days. Less is more, find a piece that is going to stand out with color or texture. Suede and metallic bags are the big thing this season so add one of those into your wardrobe to add a pop to any look. Big thanks to Banana Republic for sponsoring this post. This outfit is KILLER! I absolutely adore it form head to toe! I need the whole outfit 🙌🏼 I haven't shopped at Banana in a while but I am definitely going to start! Love your transitioning tips! I totally agree about a denim jacket.